This was the prize at the end of a long day of road trippin’. My wife created a special occasion all our own when she pulled this Grigio from the fridge and made it a featured element in a light, enjoyable dinner. Pretty sure I’ve had the Ruffino before (maybe even wrote about that experience here?) but it couldn’t have worked as well as it did on this evening. 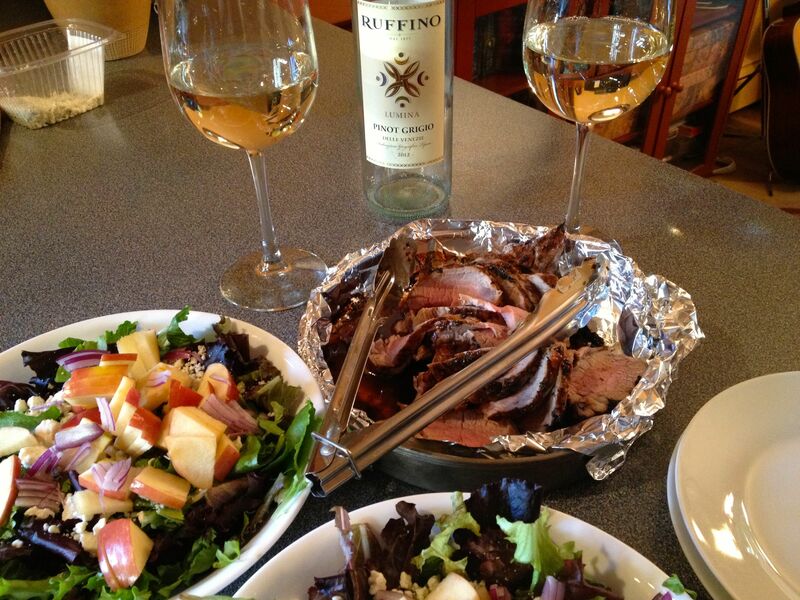 The Ruffino, fruity and cool, accompanied a perfectly cooked pork loin and a fresh salad of mixed greens, onions, apple slices, and blue cheese. This white counterpunched well with the salad for sure and I loved that both of us were working the stemmed stuff. Ruffino Pinot Grigio 2012 Lumina, Italy. They definitely have a way with words, but the whole picture comes across much better when you see it in context with our meal here. Hope you enjoy as much as we did.